Yesterday I worked half a day and then came home to rope. Mom had her little buddy with her for the first time in a while so he helped and played and kept things interesting. So I started my day with chores and then headed to get a half day of work in. When I got home I got a bite to eat and then headed to the roping pen. Not long after Mom’s Little Buddy showed up after School. I was in the roping pen but you know I had to take a little time to play with him. I roped a bit while he had snack. Then he came out and helped. He ran the chutes with Dad until I went to trying a calf. Then he wanted to go rope one himself. So I went to the barn and got one of the little calves that he could rope and play with. We had a blast for a little bit and then we went back to the roping arena where he helped until he got cold. After that Little Buddy went to the house and watched Rodeo Bloopers and helped Mom cook spaghetti. It was just like old times with him playing in the middle of the floor with the tub of horses and bulls. We ate dinner before I did chores and then headed to bed. Today I got up and got chores done before loading two horses and Lucky. Lucky went to his forever home about 15 miles away. He is now with other roping Steers in a big pasture. After I dropped him off I was on my way to get in some team roping practice. I got home in time to eat before going with Mom to get some groceries. Tomorrow is Christkindlmarkt and that is were I will start my day. Today it was cloudy all day and you could smell the rain in the air. The first part of the day was reserved for Craft day and then I spent time in the roping pen. Neither Mom nor I seemed to be able to get motivated. I had plenty of time to rope the dummy before anyone showed up for Craft day. After that I ate some lunch and was so slow to get going. I did finally get a horse saddled and the cattle gathered but I didn’t run as many today as I normally do. After Craft hour Mom spent her time in the barn. 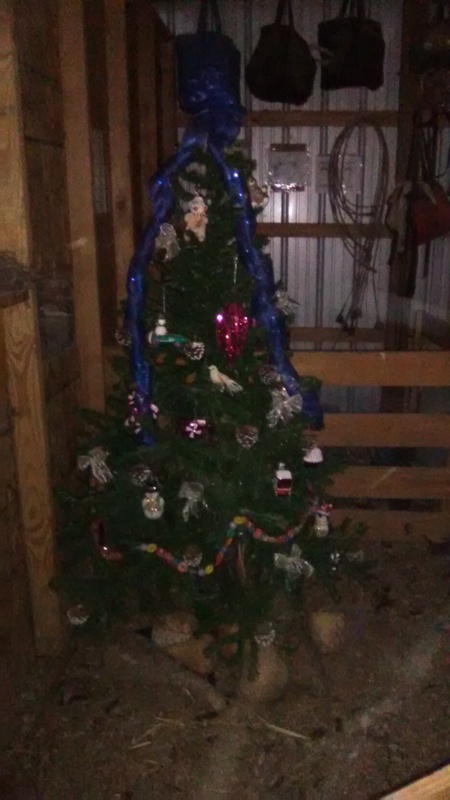 The Barn Christmas tree is now up and decorated. She also worked on the WiFi out there. For some reason it hasn’t been working so Mom is trying to figure out why. So far no luck. 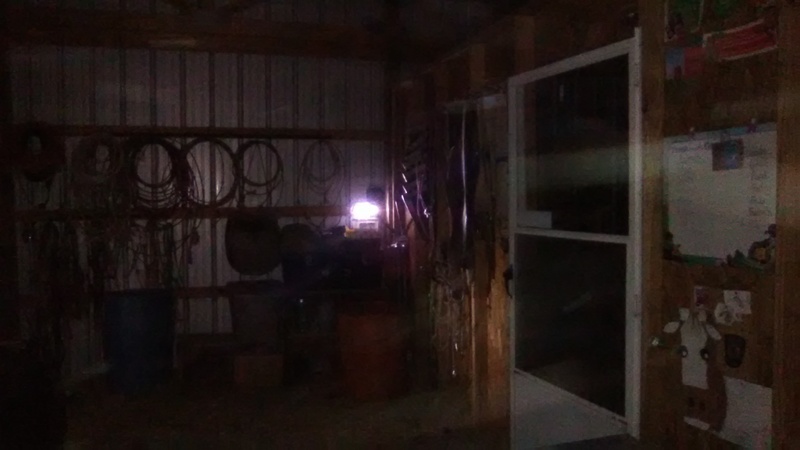 Finally she put up her bargain lights and I have to tell you they light that barn up really well. I honestly didn’t think they would do that good but I was wrong. Those 5 lights work great. This evening I put Ice in the new stalls with Derf. 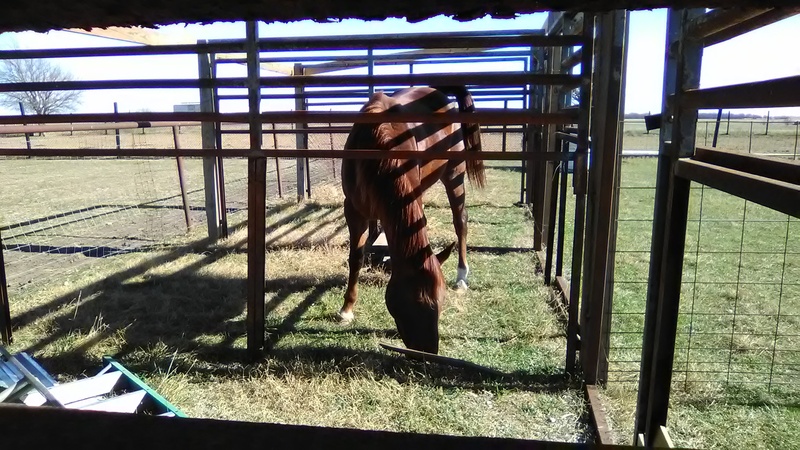 They each have their own stall to eat in but for now they are both turned out into the pen together. I am going to have to lock them in to eat and then I will need to go let them out after they are done so there is no fussing. For tonight I am off to bed to get a good night’s sleep and maybe that will get me back to my normal motivated self tomorrow. I didn’t make it home the night before last and I didn’t get in last night until after 2 AM. I had two days of roping. Mom and Dad got some stuff done around the farm but I really just ate, slept and roped. So Saturday I left for a roping. I didn’t get back to town until after 2 am so I stayed at the house of the family that gave me a ride. I slept on the couch and Dad brought me out some clothes Sunday morning so I could shower, brush my teeth and clean up. At the roping I won 1st in the big roping and 1st in the Round Robin. After I got cleaned up, We headed out to another roping. Normally this roping ends early and we are home by dark. However, this time there were over 400 teams. That made the roping take all day. I didn’t get home until 2 AM this morning. I made it to the last round in the roping where my header missed. I know that isn’t really all that exciting. 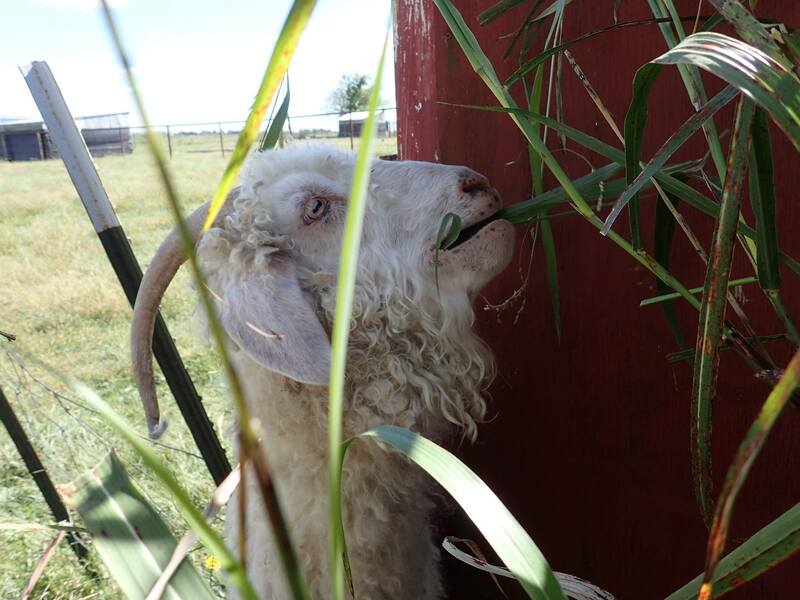 As for farm happenings I can share what Mom and Dad got done … Okay what they worked on. As both didn’t actually finish the jobs that they were working on … LOL … Dad worked on the tractor. After hours of nothing Mom suggested a new battery. So he headed off to Tractor Supply to get one. Mom had him stop on the way at Lowe’s to get the last 5 pickets she needs to finish the second stall and 3 pieces of OSB for the backs of the stalls. It took him over 2 hours. Our Lowe’s is super slow. The final thing Mom started in the stalls is that she started using a wire brush to knock off all the rust so that she can paint them with some Rust-oleum paint. This will help keep them in good shape for a longer period of time. It was after dark when Dad got everything home to finish their jobs so it wasn’t done until today. Dad got the tractor running but we now have a leak to locate and fix. 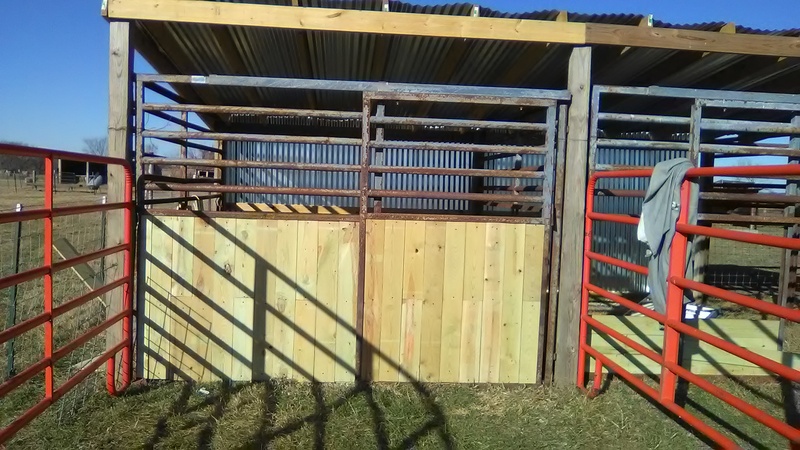 Mom got the OSB up on the back of the stalls and her last pickets in and We now have two new stalls to use. As for the OSB on the back of the stalls. 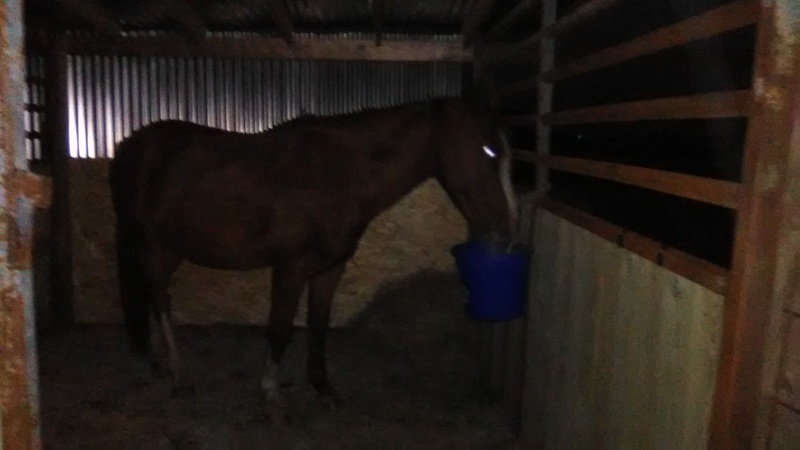 The first night in his new stall Derf kicked and pawed at the back metal of the stall so for safety Mom put wood OSB over the entire back of both stalls. This way if a horse kicks through the stall it won’t get cut up by the metal. 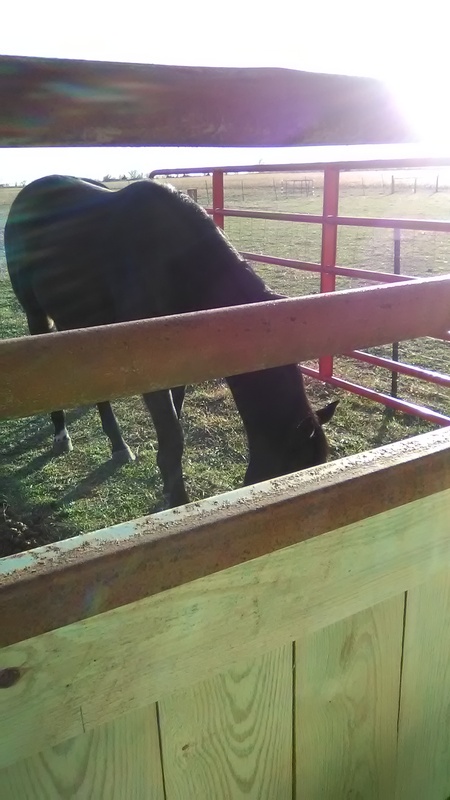 As for now I am getting some lunch and figuring out how to put those new stalls to use. I may bring up a couple of Mares and turn the men out on to Pasture. Which is funny because Mom is now giving me a hard time about her building the stalls to get Derf out of his Pen more and I am thinking of putting him out on pasture instead which is what she wanted in the first place. Well, this week didn’t go as Planned. I was suppose to work two hours each day but then I still had the other job to finish. I could just up and leave the lady hanging. I worked all day Wed and then went to a goat roping and to pick up a steer. Thursday was Thanksgiving and we spent it helping a friend. Friday we took time to help that friend stage her place and today I am headed to a roping. So Wednesday was very interesting. I worked to help a lady get her house ready for an appraisal. She is a single Mom and she is struggling since her husband left her. She is working to get a lower house payment but is kind of broke. So I worked a few days that she paid me and then I kept coming back even though she didn’t ask me too. After I got some things she really needed done, done, I left early and headed to pick up a steer. So this steer had been left by accident when the pasture was cleared. It had been surviving pretty much on it’s own for the last month. He isn’t much bigger then Gordie so he really shouldn’t have been on his own yet. On the way to pick the steer up there was a goat roping I wanted to go to so we stopped. After the roping (I didn’t do any good) Mom and I headed home. On the way we had to take the Turnpike. Well, there is construction on the Turnpike and while we were driving through that construction a tire on the trailer blew. They are new tires and that shouldn’t have happened. We had to call the Highway Patrol to help us get to safety and get the tire changed. There is suppose to be a new left lane law that went into effect Nov. 1st. It says you can only be in the left lane to pass. Honestly, That law doesn’t work. As we moved to the left lane as that was the only shoulder in the construction zone. And we tried to get it changed without the flashing blue and red lights. However, That didn’t happen. Once the Highway Patrol got there it was amazing the number of people who moved over, slowed down and drove nicely. I just really don’t understand why there was so much traffic at 1 AM on Thanksgiving morning on the turnpike. When we got to the end of the Turnpike it absolutely just dropped off. The traffic died away and it wasn’t as if we weren’t on the same exact road just with no tolls. Crazy if you ask me. When we finally made it home safe, I went to bed after settling “Lucky” in (we dubbed the steer lucky because so far in his short life, he has survived on his own for a month and having a blow out in a construction zone on the turnpike … he is one lucky dude as Mom said) While I went to bed, Mom got to work getting a turkey and ham in the oven. She had already spent the day baking pies and get feed for the animals to get them through the Thanksgiving Holiday. Then she took me to get the steer and to the roping. It was quite a night for Mom … and for Me and Lucky too. Thanksgiving Morning I got up and did chores before heading out to help the Lady again. The plan was that since Dad had to work, I would go work for her. Then I would bring her and her Mother, who is in a wheel chair, back to eat with us when Dad got home. Then as luck would have it Dad called and said that it was going to be a long day and that they wouldn’t be getting off early for Thanksgiving. Then Sister called and with everything the way it was, They hatched a plan. Mom loaded up a good part of the meal. She also loaded up tools and paint brushes and anything else she could think of that we would need to get the job done. Then Sister and her Hubby drove Mom and the meal to me and my employer. Mom called and let me know what was going on. I kept it to myself until Mom pulled in the driveway. The three of them started unloading food and we all took time to eat. After that they popped the trunk and started unloading tools and stuff. To my employer’s surprise we all got to work like it was nothing. When Dad got off work Mom told him what was going on and he headed that way. With all of us pitching in when the sun went down EVERYTHING was done. We took a pie break before Sister and Dad headed out. Sister had another dinner to go to and Dad went home to do chores and get to bed because he had to work the next day. Mom and I stayed and cleaned up the meal and promised to go back in the morning to stage the house and clean up all the things we couldn’t get picked up after dark. Friday morning I got up and got chores done while Mom got stuff together to stage the lady’s house. When we got there we cleaned up the last of the tools and painting supplies before lunch. Then again Mom had brought food so we all ate. I did notice that the Lady said she had slept better Thanksgiving Night then she had in awhile. I guess she was now hopeful and not worrying about getting everything done before the Appraiser came back. We spent a couple of hours staging the place before we left her to enjoy her new space. She was even so pleased that she took pictures to show off and record how much we had gotten done. By about 2 we were headed home where I got to roping and Mom worked on her stalls. She really wants to be able to get Derf into those stalls this weekend. Okay, really she wanted to get it done last weekend but that didn’t happen. So she is working to get it done. She got all but one section done in Derf’s New pen before the sun went down. Today was Tuesday. That means craft day. Then I was off to work. I got home in time to eat, do chores, blog and then I am heading off to bed. So today was Tuesday and every Tuesday in November we have Kids Country Christmas Craft days. Most days we get a small group but today we were suppose to get a bit larger group so I stuck around to give the pony rides and help with the roping. However, as the day progressed more of the group texted the leader and canceled. We ended up with 6 kids and 2 adults but it was okay. The smaller group wasn’t anything Mom couldn’t handle but it was fun to have stuck around. They started with their craft and the kids had a blast. It had paint so what kid doesn’t like to paint. After that they headed out for a farm visit, pony rides, animal feeding and in barn centers. They all loved the animals and the funny thing was that the shyest little girl was the one that wasn’t scared of any of the animals. Her older sister though was a bit scared. Even her Mom was impressed with how she did. She even rode the horse without even thinking about it. As for the horse that gave pony rides … It was Whiskey. She did great. She did decide on the last ride that she thought she was suppose to be done but I made her finish. After that they all visited the gift shop and some even found a few little pretties to take home. After that I headed to day work again. We removed a hot tub from the deck and got a bit of painting done. Then I headed home. Mom fixed some left over tacos as she had the stove full of breads for Thanksgiving. She had made Banana and Pumpkin. She makes them from scratch so it takes her a bit. Only Fresh Bananas and Home processed Pumpkin for her breads. I got chores done before sitting down to blog so I am now headed off for a shower and then to head off to bed. I have to work tomorrow again. Mom will be making pies and going to get feed for the holiday weekend. So today was a bit off. First, I was suppose to go to a job off the farm at 9am. That didn’t happen because Mom had to go make a payment on Dad’s latest ticket. While in town Mom wanted to go ahead and get the Thanksgiving shopping done so she didn’t have to make two trips. Good thing my day job let me come in about noon. So I got up and did chores after eating. Then I helped Mom trim off the extra tin from the top of the new shed so that we can put trim over it. The wind was blowing a ton again today and with the cold that is really all the work that got done on them today. I did try to straighten the bent leg of the one panel and I got it part of the way but it will take a bit more work and I needed to get to my day job. Anyway, you get the point. By Noon I was at work and we got the house prepped for painting. I got home and found Mom had cleaned the entire Kitchen getting ready for Thanksgiving. She also got the projects ready for tomorrow’s Kids Craft Day so that is okay by me … that means this time I don’t have to help put them together … LOL. I did chores, watched a episode of Criminal minds, ate and am now getting ready to head off to bed. Tomorrow we have the craft day so I won’t be heading to day work until after that. After a long night of sleep I headed to a roping. Dad slept until after noon and Mom worked on the new stalls all day. Funny how Mom is the first one up, gets the most done and the last one to bed. Yup once again Mom was the most productive around the farm today. So I got up and got chores done. Thanks to Dad, who has been on one of his tantrums lately, I found all the horses in the Shetland pen this morning. Seems someone can’t close or latch a gate. When I got the animals all sorted and chores done, I went and got me some breakfast. After that Mom had a few things she asked me to do before I headed out for the day to a team roping. I won third so that is a good thing. I had three others with me but only one of them roped. She also helped with the books at the roping but the other two just went to hang out. 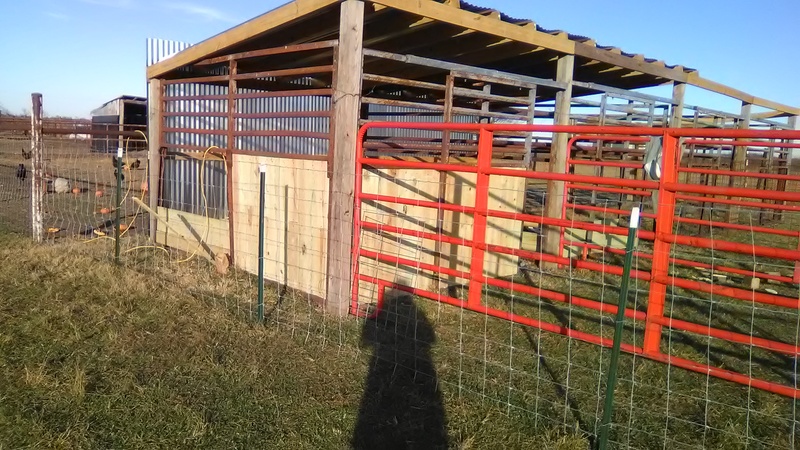 While I was gone Mom put the back on both the new stalls and got 4 of the 6 sections done in the first stall. She also got the two runs put on the stalls. Not to mention she had Whiskey with her part of the time in the turn out pen and Derf with her the second part. She also bottle fed the little calf and helped me move Ginger to the Shetland pen before I left. The final thing she got done was to get a wish list done on Amazon. For those asking as to what we could use for Christmas, we think we got it listed as the Straw Family Farm. If you can’t find it let us know and Mom will try again. Ginger is doing great. She didn’t chase the sheep or even really pay them any mind. Which is a good thing. She also was caught checking out the pumpkins. Who knows maybe she will like them. 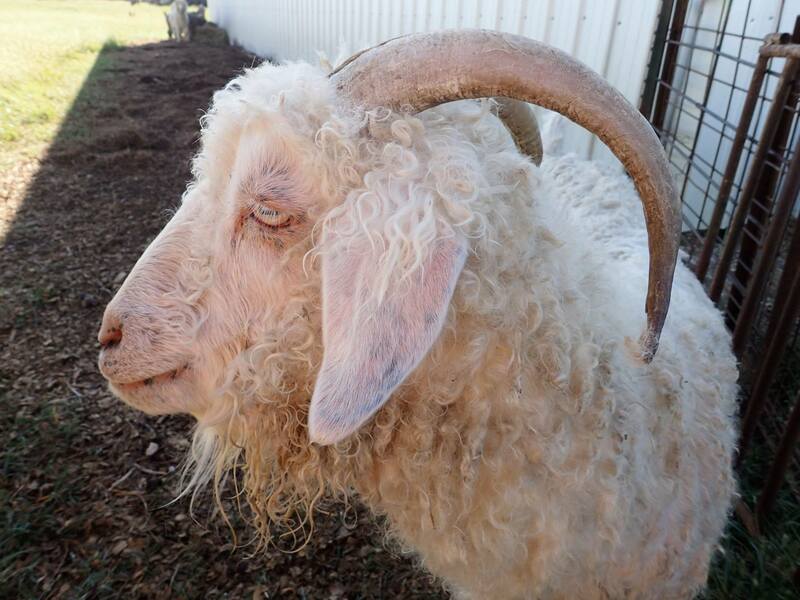 Since today went so well, if we have no issue through the night, I think tomorrow she will take her place in the sheep and goat pasture. That will make each pasture have a donkey to guard it and Jethro and Hank can patrol but not work as hard at keeping coyotes and other dogs away. 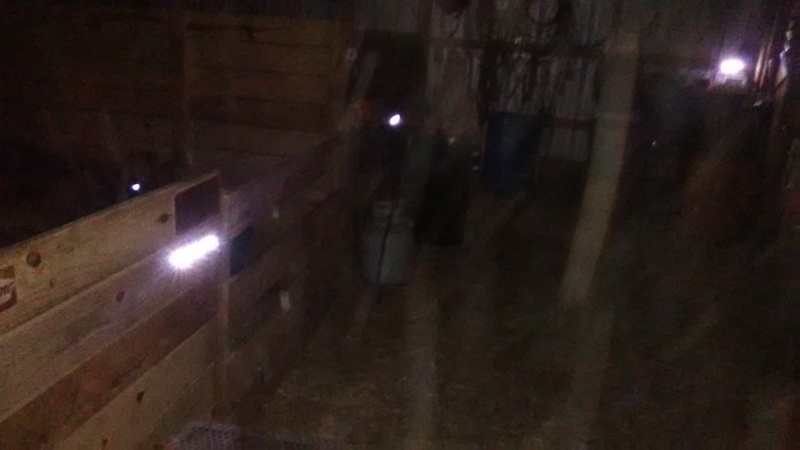 Anyway, Dad did get a bit of cleaning done on the calf pen in the barn and the chicken coop but then again If I had slept 16 hours straight I probably wouldn’t have time to get much done either. Now to make this post a bit more exciting check out the work Mom got done.